Ordinary golf carts and other electric vehicles require extraordinary batteries to keep them humming worry free. 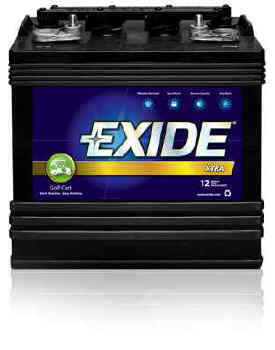 Since nothing ruins a day on the links like a dead golf cart, Exide makes an advanced line of golf cart and electric vehicle batteries designed for increased cycle life and reduced maintenance time. All this backed by Exide’s strong nationwide warranty program means you can worry more about your swing and less about getting to the next hole. Cast-on strap/through-partition connectors provide improved electrical conductivity and strength for superior vibration resistance. Features RC Ratings up to 525 RC. Features AMP hour ratings up to 245 AMP hours (20 hour rate) for increased service life per charge cycle. Available in 6 volt and 8 volt.